Para-Lite 5™ is a shallow, small cell louver offering maximum illuminating efficiency while maintaining low brightness. It meets or exceeds most energy codes. These louvers are easily installed in lighted ceilings, fixtures or retrofit installations with little or no modification. 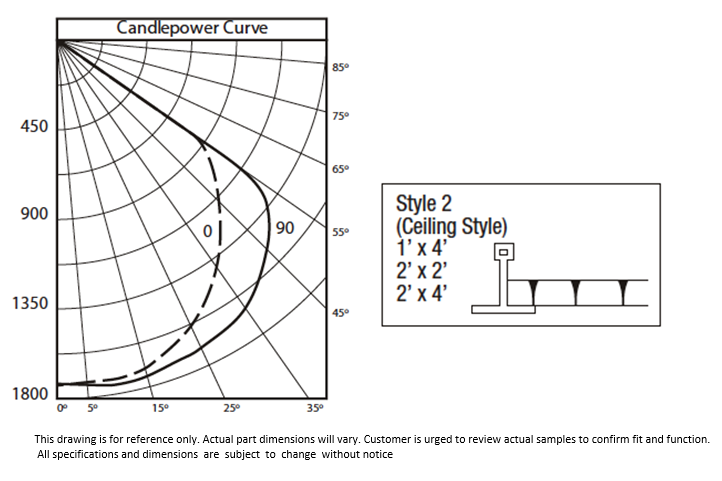 A 28° shielding angle also conceals lamps well. Medical facilities, department stores, conference rooms, entries and corridors, perimeter lighting, computer rooms and elevators. Note: All Deco-Round louvers are destaticized before and after fabrication to ensure a high quality product. Parabolic Louvers shall be Para-Lite 5 shall be one piece injection molded of polystyrene base material with all parabolic surfaces prepared with a primary undercoat and a highly specular vacuum metalized finish. Nominal cell dimensions shall be 3/4” x 3/4” x 3/8” high and shall provide 28° shielding with a louver efficiency of not less than 70%. 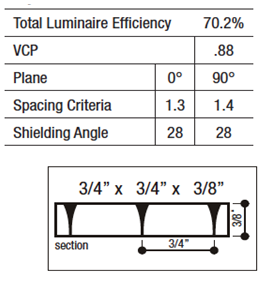 This louver has a VCP index rating of .88 (specular silver finish) and a .75 coefficient of utilization for a RCR of 1. Panels will sometimes require additional cutting for proper installation. For color designation use B for black, W for white. For specular finish use SPS. Louver panels are designed to fit any standard 1’ x 4’, 2’ x 2’ or 2’ x 4’ tee bar grid system. Special sizes are available, contact Diffuser Specialist. Diffuser Specialist parabolic louvers are the most sophisticated and optically precise lighting control panels available in the industry. The proper installation, care and handling of these louvers will ensure excellent light control and product serviceability for many years. Great care should be exercised when handling parabolic louvers, avoiding contact with oily and/or foreign substances. Always handle louver panels with clean white gloves – never use bare hands. Always install these louvers after the space has been completed and is ready for occupancy – never during construction.